I’m very much looking forward to an upcoming trip to Germany and Austria, at the beginning of October 2014. There are three notable events to tell you about. I hope my friends in these locales will be able to attend! First of all, on October 3rd, I’ll be performing at the Wartburg Festival, at the Wartburg Castle on the mountainside above Eisenach, Germany. This is the annual Wartburg Festival “Long Night of the Trumpet” concert which, this year, features Otto Sauter (DE), Marek Zvolanek (CZ), Vlado Kumpan (CZ) and myself. I’m honoured to be returning to this beautiful concert hall, and in such austere company! Please click the image below for more information. Then, on October 5th, I’ll be in Mank, Austria – home of Schagerl Meisterinstrumente – for 2 events. In the afternoon, from 1:00pm to 4:30pm, I’ll be presenting a workshop – “Increasing Efficiency” – at the Musikschule Mank. 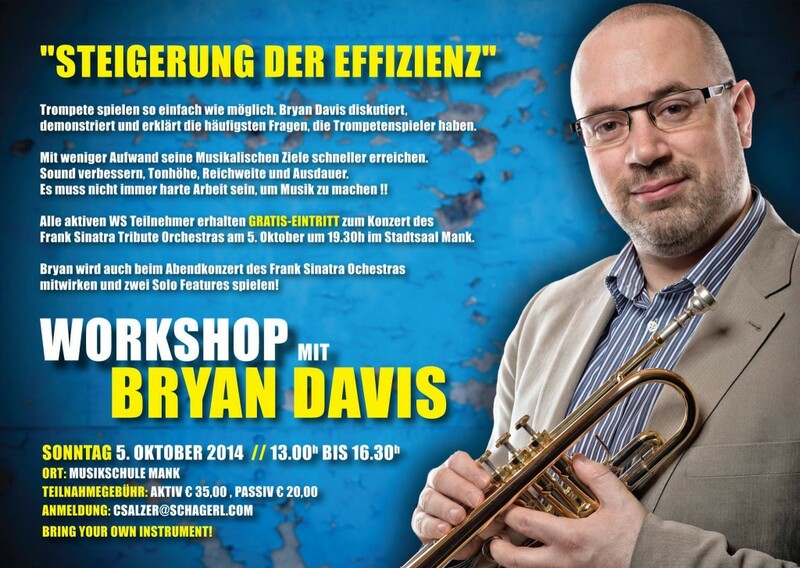 This workshop is aimed at brass players of all styles. I will discuss and demonstrate a number of the common issues that prevent us from playing our instruments as efficiently as possible, thus making it harder than it needs to be to make music. My goal is for players of all levels to experience an easier way of playing. There is more information, in German, on the poster below. You can click it to email Christian Salzer at Musikhaus Schagerl to reserve your place. 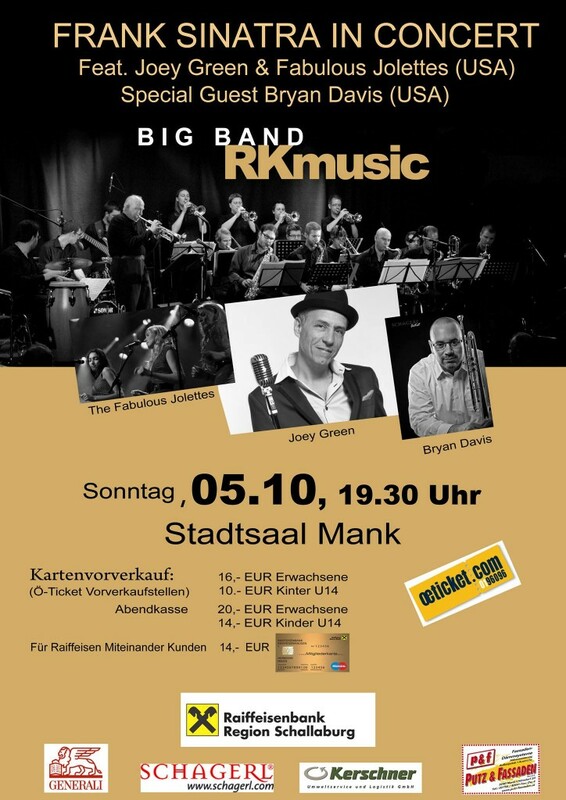 Then, in the evening of October 5th, I’ll be guesting with the RK Music Big Band, for their Tribute to Frank Sinatra, featuring Joey Green and the Fabulous Jolettes. I’ll be leading the trumpet section and playing a couple of solo features, as well. My friend Robert Kerschbaumer (the aforementioned RK) has a very fine band and this promises to be a splendid evening of music! We perform in the Stadtsaal, in Mank, at 7:30pm. There is more information on a Facebook event page which can be reached by clicking the poster below. I hope to see many of you while I’m in Europe. Of course, if you’re interested in taking a trumpet lesson while I’m nearby, please contact me and we’ll try and find a time.